Fantastic Cabin in the Smoky Mountains of Tennessee! Amazing Cabin with stunning views of the Smoky Mountains! 'Diana's Dacha' is a fantastic getaway for you and your family at a reasonable price. Just outside of Pigeon Forge, and less than a 15 minute ride into Gatlinburg, the entire area offers an enormous amount of activities for your enjoyment. Enjoy hiking, horseback riding and white water rafting during the summer. Ski in the winter. Explore the national park year-round. Fabulous dining, amusement parks, Dollywood, Gatlinburg Aquarium, great shopping...just loads to do! Less than an hour from Harrah's if you want to try your luck at the tables. 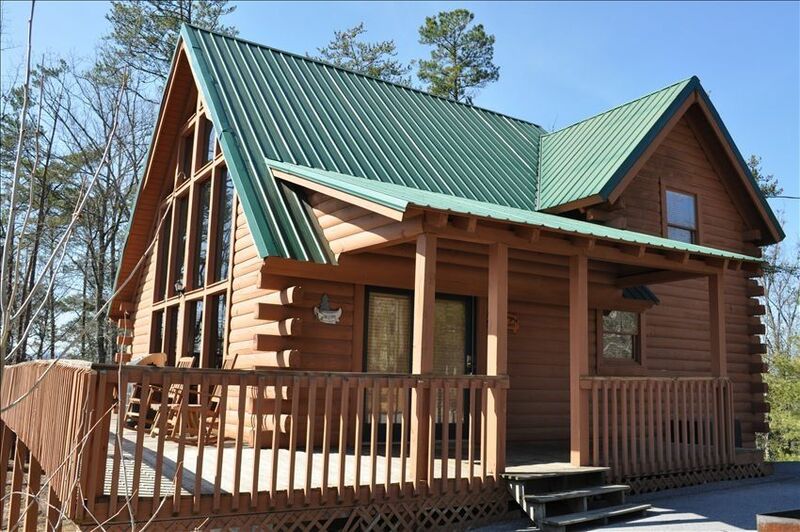 Our two bedroom cabin includes a hot tub, game room, cable, high speed internet access...all the amenities. 'Diana's Dacha' is easy to access all year. Though the cabin offers a great deal of privacy, we're only a few minutes out of town. Because of this, the roads to the cabin are all well paved, making it easy to navigate at night and during the winter. Check-in is at 3pm and checkout is at 11am. We are Pet Friendly. Please contact us before booking regarding size, number and type of Pet and we will try to accomodate. Enjoyed our stay. Nice cabin with beautiful views. Close to everything. Excellant! Easy in, close to Pigeon Forge. Amazing cabin, very close to Pigeon Forge. Huge windows with great views. Hot tub was very clean. Pet friendly is a HUGE plus! We felt like we spent hours trying to find a perfect cabin for our trip and finally found this place. Highly recommended and will certainly be staying again. I am apparently the guest that came in just after the lady that has left a very bad review. Yes when we arrived the heat was not working. I called the owner he was back to me in minutes, had a repair guy there the next morning, fixed it and we went on about our merry way. No biggie. I did not notice all the bad things in the other review, but I don't expect to find Wedgwood in the cabinets of a rental cabin nor do I expect a hermetically sealed environment. Overall nice place. Responsive owner. Poorly taken care of. Needs attention. The place needs a good cleaning. Carpet dirty/registers dirty/blinds in bad shape/flooring needs attention/table top needs refinishing. The pots and pans need replacing. The heating cooling system does not work. No screens on windows. The kitchen window has no lock!! * We had no idea the AC/Heating Unit was down during your stay. It was first reported to us by the new Guest who checked in yesterday. We sent out a repair crew immediately and would have quickly addressed this had we known there was an issue. * In the rare instance a Guest is dissatisfied with a Cleaning item, we send the Crew back in right away. Unfortunately, we did not know there was an issue during your stay. * We depend heavily on Guest feedback, and will be visiting the Cabin ourselves this weekend. All the items you mentioned will be carefully reviewed. For future Guests, please contact us immediately if anything is not to your satisfaction so we can address your concerns during your stay.